We are a leading Manufacturer of 1 kg gold bar vacuum casting making machine and gold induction melting machine from Ahmedabad, India. Vaccum Gold Bar Making Machine. The vacuum gold bar making machine is designed for quality gold and silver bars, ingot and bullion casting with customized weight and size. The gold bar quality is approved for LBMA deal. The whole casting process is under the vacuum and inert gas protection. It fully avoids bullion’s oxidation, loss, shrinkage, and water wave. There is almost no loss of precious metal. Its advanced features like PLC touch screen control, fully automatic casting and 24 hours continuous working show its latest green technology in gold industry. It highly improves production efficiency, bullion’s quality safety, and saves liberation of manpower. Anymore, it is flameless to ensure worker safety comparing with traditional casting ways. It is flameless to ensure worker safety. 24 hours continuous working will meet your long-time casting goal. The machine provides the following advantages: Quiet operation, High efficiency, Self-diagnostics, low pollution, and low noise. The casting condition is fully sealed to avoid flame touch for worker safety. It is the most saving, safe and efficient way for gold and silver bar making until now. 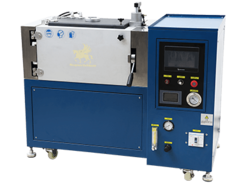 HK Gold Induction Melting Machine designed for melting precious metal.